I stopped the one in front of me, and fidgeted lightly as it came to a stop. Particles of iron filled the air as the never-ending chatters between the minibus drivers continued with their baritone voices. People came and walked in slowly to look for the most comfortable seats between the other passengers and tried to occupy the places before others did. These passengers would pull out their phones, as though rudely asking others not to mind her presence there, or sometimes, when the cloud finally did its timed wails, thin-clothed mothers would make small talks with the person closest to them. The space made of corroded iron and intermixed carbon dioxide from strangers and gas emissions, with two hard iron benches welded awkwardly to both left and right side was an everyday sight for some, but an avoided sight for others in Depok. For me, it was the former. I liked seeing people and their activities from the other side of the transparent plastic. I would try to keep my eyes open despite the harsh air blurring the faces of people around the roads, for the sole purpose as not to feel awkward for being in the minibus. Often, dust would run into whoever was unfortunate to sit near the rectangular hole in the thin wall. That person would sniff and try to fix the hole by instinct, hurriedly reaching the sliding plastic’s handle to pull it hard, while the other person next to them would inch away solemnly. I happened to like the dirty air of the children-friendly city because I was afraid that if there were too many people in the minibus, but there were too many windows closed, all of us passengers would die from oxygen deficiency. Once, when I told one of my friends the secret reason why opening all windows in the minibus was a must, she told me I was paranoid. She was right, so I agreed with her while still widening the four-sided holes of the minibus’ walls. Guessed difference in opinions happened anywhere, including transportation means. Of course, as the proud satellite city for Jakarta, people from all over the country lived here. And obviously, as a famous means of transportation, minibuses would profit from these people pushing their luck in the harsh capital city. My mother used to take me with her to malls in the northern part of Depok City. As we were on the way, we had to inhale the rusty oxygen of the afternoon air for fifty minutes. That was the length of eleven TED-Ed videos. As a child, the minibus driver would always tell my mother to put me on her lap, so other passengers can fill my place. It was unfavorable. Making your mother’s legs feel sore was never favorable. Older people especially other parents would make funny faces towards me, because I was a child on her mother’s lap and they thought I would like it. Sometimes, when I recall those times, I think my five-year-old self laughed back because of the irony. A cap or a wrinkled candy’s pack would be shown to the passengers, signaling that their songs had ended and it was time for them to collect some of their rights. People who sympathized with the pengamen would put at most IDR5.000 into the hat, but many put changes or even did not give any Rupiahs to the boy. The pengamen would thank and prayed monotonously for us before jumping off the minibus, in the same style as the one they did when they get onto the vehicle. Not long after the last pengamen went, came another, bringing identical music as the previous. Minibuses were fast and steady. They forgot quickly, they moved on to the next song. The minibus’ passengers were from every places and culture of Depok. The direction of the shadows of the day also counted for the type of people who came into the minibus. In the time when the shadows were fresh and faced West, most passengers were middle school and high school students, with their old-school putbir (putih-biru lit. white-blue) or putab (putih-abu-abu lit. ‘white-gray’) uniforms, talking about the assignments they had not done, or about the upperclassmen they had a crush on. It was cute. I remembered the times where I would stand patiently at the side road in front of the nearest mosque, tilting my head every once in a while to the right to check if my minibus had come. As the shadows of the day became shorter, majority of the passengers changed into mothers or teenagers. The mothers oftentimes brought a pink or blue teddy bear bags with an umbrella in their hands, while the teenagers would talk loudly about how they would find the cheapest sling bags in the store. As the tired shadows faced East, the middle school and high school students barged in, with downwards smile on their orange faces that shone under the evening eye. These rusty vehicles were easily the beat of civilization in Depok. Going around the city with your own vehicle was a whole new burden. The traffic jam was the main reason. These cars and wild motorcycles would honk all the time, thrusting your eardrums with united annoyance and impatience of the crowd who never minded the road lines. Children inside the moving, cubicle iron would scream and drink their own salty waters. It was never, never a sound journey with the minibus. As minibus was the life of the traffic party, it was also the thing that aged most Depok civilians, both mentally and emotionally. We still step on the running iron cubicles, though. 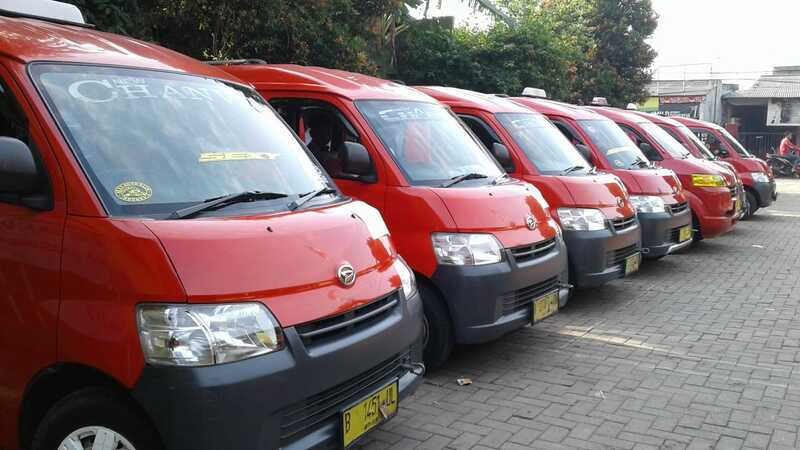 Were any Depok civilian to be asked whether they wished the minibus were gone, they would say, “I could not live with minibus, nor without minibus.” At least, I would answer exactly that. So I stopped the one I was in and got off.